Whether its town halls, sales training, on-boarding, or customer webcasts, corporations produce events every day. Most events include remote attendees, participating via computer or mobile device. These attendees are already familiar with video, since they use video technologies on their mobile devices (Skype, FaceTime, Google Hangouts, etc.). They’re expecting something similar from corporate events. Unfortunately, they rarely get it. Technology for web conferencing provides interactivity for small groups, but it has worked for large groups. Instead, corporate events revert to one-way broadcasting with limited opportunity for engagement. Today’s employees are multi-taskers and it is hard for them to focus on slides for an hour. In fact, many attendees even plan to use the time during webcasts to catch up on email. This prevents learning, and it circumvents the whole purpose of the event. Communications technologies, at their core, try to replicate the in-person physical meeting experience. The best technologies are the ones that closely resemble the physical experience, so that users can interact naturally without being distracted by the technology itself. Users have shown a strong preference for high definition, full sized images, face-to-face set ups, good eye contact, high quality audio, and other elements that add to the "in person" effect. 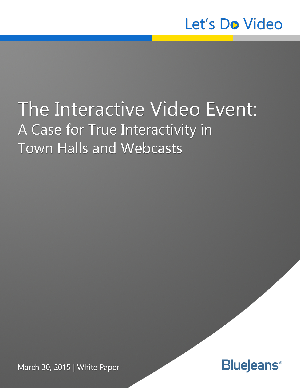 Technology for large virtual events has not delivered the “in-person” experience. Presenters are generally limited to voice and screenshare. Audience questions are submitted through chat and routed through a moderator, so there isn’t a connection between the presenter and questioner. No one can see the audience or how they’re reacting. In short, there’s no real back and forth, so attendees fall into passive participation. This white paper, written by David Maldow, Founder & CEO of Let’s Do Video and one of the most prolific writers in the video collaboration industry, will explain why webcasts aren’t fully interactive, why you should care, and the potential benefits of full interactivity for large-scale business video events.